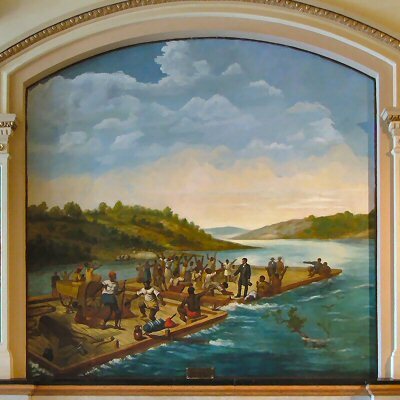 "Future Illinois Governor Edward Coles Freeing His Slaves While Enroute to Illinois1819"
From the New York Times, "Setting Them Free," on August 7, 2005, by Adam Goodheart: IN the summer of 1814, a young Virginian named Edward Coles -- a protégé and family friend of Thomas Jefferson -- wrote to his mentor asking for some advice. Coles, who had inherited slaves from his father, was considering setting them free, and sent off a letter seeking Jefferson's blessing and guidance. These remarks -- especially the famous ''wolf by the ear'' comment -- have long been quoted by historians to illustrate the supposed predicament of antebellum America: the South simply could not free its slaves, and since the North would not let it keep them, a bloody struggle between the two was inevitable. But what if Jefferson was wrong? What if the dreaded wolf would merely have licked his lips, trotted off and gone quietly about its business, had Southerners just mustered the courage to release their grip? Two recent books profile major slaveholders -- both Virginians, and both members of Jefferson's social circle, although they appear never to have met each other -- who did let go of the wolf's ear. Their deeds, unlike Jefferson's words, have been largely forgotten, even by scholars, over the past two centuries. And yet those deeds offer eloquent testimony to a past more complicated than it has often been portrayed, and to the manifold paths that Americans -- both black and white -- have followed in their pursuit of freedom. No less in their own time than today, both Robert Carter III and Richard Randolph would have seemed unlikely apostles of liberty. Scion of one of Virginia's wealthiest planter dynasties, Carter was the grandson and namesake of Robert (King) Carter, a ruthless land baron who bought and sold thousands of Africans and successfully petitioned the provincial government to let masters amputate slaves' toes as punishment for running away. A portrait of the young heir from around 1750 shows what one might expect: a smirking dandy in a shiny gold waistcoat. As for the similarly blue-blooded Randolph (Jefferson's cousin, no less), his only previous claim to fame was having stood trial and been acquitted, at the age of 22, for allegedly impregnating his wife's sister and then killing the baby. Shortly before the end of the 18th century, each man arrived at a similar epiphany, although the separate routes they traveled could scarcely have diverged more. Carter, who had watched the American Revolution mostly from the sidelines, experienced a religious awakening -- first as an Anglican, then a Baptist, then a member of the Swedenborgian sect -- that seems to have left him with an almost mystical antipathy toward slavery. Andrew Levy describes his transformation in ''The First Emancipator.'' The much younger Randolph, on the other hand, was a secular humanist whose fervent admiration for both the American and French Revolutions led him to embrace a philosophy of radical egalitarianism, as Melvin Patrick Ely writes in ''Israel on the Appomattox,'' the winner of a Bancroft Prize this year. But both men, unlike Jefferson, were ready to put their principles into practice. In 1791, Carter began a manumission process that would eventually free some 450 people on his northern Virginia plantations and beyond. In 1796, Randolph's early death set in motion the liberation of his 90 slaves along the Appomattox River in south-central Virginia. Two generations before the Civil War, these African-Americans found themselves living as free men and women amid a society that -- for all its drum-thumping about liberty and independence -- did not know quite what to do with them. These two books, though as different in style and substance as the two emancipators themselves, complement each other almost perfectly. Levy focuses throughout on Carter's psychic and religious struggles as he progressed haltingly toward the act of manumission; his slaves appear only as supporting cast. Ely dispenses with Randolph in less than 20 pages and spends the rest of the book chronicling the lives of the freedmen and their descendants over the ensuing decades. Levy's book has a somewhat misleading title -- Carter was far from the first American to liberate his slaves, nor can he, except by a mighty stretch, be called a founding father. (''The First Emancipator'' grew out of a 2001 essay in The American Scholar that was provocatively titled ''The Anti-Jefferson''; Levy and his publisher ought to have stuck with that.) Yet the author, a professor of English at Butler University, brings a literary sensibility to the study of history, and has written a richly complex book, one that transcends Carter's story to consider larger questions of individual morality and national memory. By contrast, Ely, a historian at William and Mary, appears to have dwelt happily for years in the world of rural antebellum Virginia. His book teems with details (often too many) of the lives of Randolph's freedmen, particularly those who settled a small community beside the Appomattox called Israel Hill. Teamsters, farmers, boatmen and shoemakers are treated in turn, as Ely mines land deeds, court records and wills to plot the former slaves' slow but steady accumulation of acreage, offspring and civic status. If ''Israel on the Appomattox'' sometimes plods, it does so in the service of an important argument. Like Jefferson, many antebellum Americans believed that free blacks could never become productive and well-adjusted members of society, especially in the South. The Israel Hill settlement became a testing ground for their theories; as early as 1836, a pro-slavery author visited and reported with satisfaction that the ''idleness, poverty and dissipation'' of the liberated slaves ''render them wretched in the extreme, as well as a great pest.'' Even some historians have maintained that free blacks before the Civil War were scarcely better off than bondsmen. Ely finds little idleness and wretchedness in the lives of Israel Hill's inhabitants. On the contrary, many of the former slaves and their descendants became solid Virginia yeomen, sturdily self-sufficient members of a dynamic agrarian society. Race aside, theirs was a community strikingly similar to the Jeffersonian ideal. The name Appomattox, of course, became synonymous with something rather different: the culmination of the violent struggle over slavery that Jefferson, in his pessimistic 1814 prophecy, foretold. Both these recent books, however, invite us to imagine -- as Carter and Randolph both did -- the more optimistic vision of an America that might have been, one in which ''generous energy'' prevailed over bloodshed. Thanks. 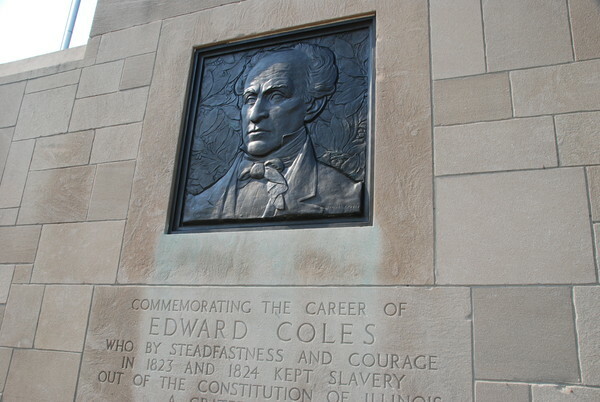 I stumbled across this post wondering what became of Edward Coles' freed slaves. So, I'll be reading the Ely book soon.